So it’s been one week since surgery. Thought I’d give a few updates today on where things are at. Nausea: gone. Unless I take medicine, which I take as little as possible. Appetite: Since the nausea is gone, I am getting hungry a lot. This is a good thing. I am supposed to be eating three small meals plus three snacks a day. I have not managed that yet but I am working towards it. Weight: I’ve lost 13 pounds in one week. The doctor recommended not losing over 12 a week if possible. I’m close. Numbness: Has not changed. 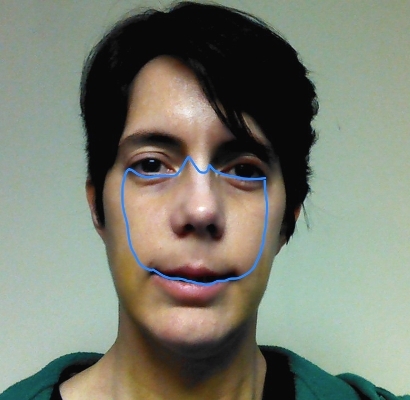 The picture shows the area that is numb. Also included is the roof of my mouth right behind my front teeth. Sleep: I got a full night’s sleep last night!!! I do make myself wake up multiple times to check on things but otherwise slept well. Hoping this continues. Medicine: Taking liquid ibuprofen before bed gives me enough relief to sleep. Not sure I could otherwise. I’m not taking any other meds except the antibioitic mouthwash. Cleaning: I have to clean my teeth after every single time I eat. This is rinsing with saline water then brushing the outside of my teeth. Twice a day I have to use the mouthwash. Stitches: I think I have three places with stitches in my mouth. All upper gum area inside the mouth. One under my nose and one in each far back corner. Since I can’t feel my upper gums, and it’s too swollen to look in my mouth, I don’t really know where the stitches are. I am very hesitant to brush too close to where they might be. Makes it tricky to clean. Eating: From day 1, I have eaten and drunken using a mirror on the table beside me. I cannot always hit my mouth when I can’t feel it all, so have to use the mirror to make sure I don’t stab myself. Also to make sure there’s no leftovers hanging around that I can’t tell are there. The mirror is indespensible. They should tell everyone to get one. Energy level: very slow to regain. However I did start feeling better in conjunction with eating more. I have been walking some around my rooms once in a while and it’s easier than it was. I tried going upstairs yesterday (really wanted long hot bath) and it took a lot out of me. I feel like lost all my muscle tone overnight. Even filling a syringe with food is draining. 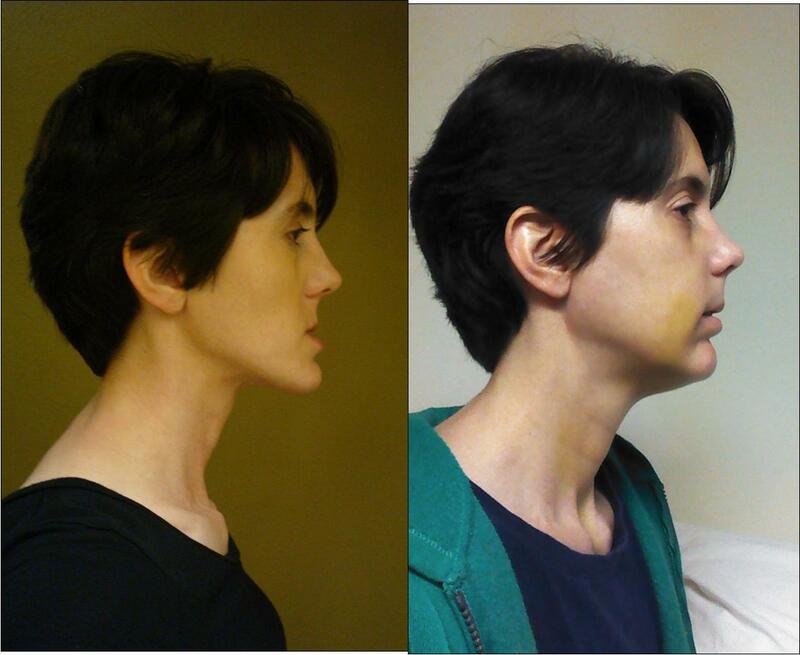 And last, since it’s one week, thought I’d put in a comparison photo. The first is taken the night before surgery. The second is today. Keep in mind I am still puffy in my frontal face and cheeks, and under my chin. Still the difference is amazing to me. I don’t think I really comprehended how different I might look. I can’t say I like it but surely it will improve as the swelling goes down. Glad to hear you are feeling much better. Yes, you do look very different. That must be a weird feeling. It will be interesting to see reactions from people when you get out and about! Going out tomorrow for the first time! Quick trip but we’ll see how it goes.